Our world is where we are. Each of us have been placed within certain realms of influence - in a family, at work, in social groups, in neighborhoods, in recreation activities. God connects us with these people for a reason. 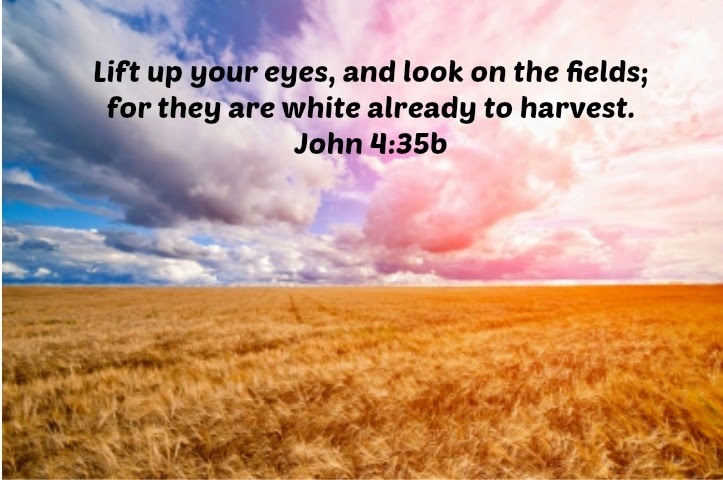 In John 4:35-38, Jesus shares with His disciples (which include us) that now is the time to harvest. He talks about the field. That field is the world around us full of people who need to know Him. He talks about how the field is prepared now - not later, not when it's convenient - NOW. He talks about how we might not personally get to reap the benefits of the seeds we sow. I might share with someone about Jesus, and they might not make a decision at that time, but the seed has been sown. Some time later, someone else may actually get to be a part of that person's choosing to follow Jesus. That doesn't negate the part I played; instead we are partners in the harvest. We get to rejoice together according to verse 36. It's so easy for us to miss the opportunities that are all around us. I can easily go all day long with my single-minded focus of what I need to do each day and completely miss the people around me who need to hear about Jesus. My goal this week is to be more aware of the people around me and remember that everyone will spend eternity somewhere. What can you do this week to be more aware of the needs of those around you?